Whether the incoming reports about climate change have you concerned, your power and electricity bills are on the rise, or both, it’s time for a change. 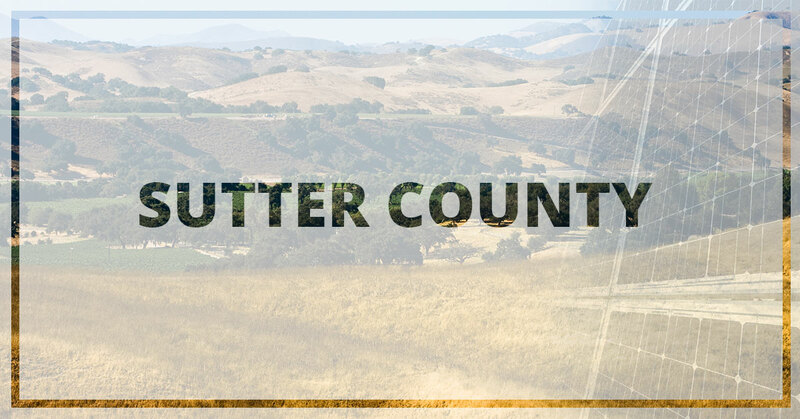 At West Coast Solar, we believe in empowering the homeowners in Sutter County to take control of their energy through their own solar power system. Did you know that the average household emits 20 metric tons of carbon pollutions each year? That’s too much, in our opinion! Many of our Sutter County clients find that environmental issues are some of the top reasons to make the switch to solar energy. This includes both business owners and homeowners! How much money goes to your power bills every month? More than it should be! These bills are a huge expense for most homeowners, but with solar power, they become much less of a concern. In fact, many of our solar system users find that their electricity bills disappear for good! Also, these array users get a nice federal tax credit to help with the initial cost of installation. In fact, until 2021, solar power users can get a dollar-for-dollar reduction in their federal income taxes. However, that does end after 2021—so now is the time to give West Coast Solar a call to install your home solar power system. If you feel fulfilled and renewed when you are in charge of your own life, then solar power is another way to add to that joy. You can generate clean, renewable energy—right on your property. By tapping into the sun’s abundant resources, you can reduce your reliance on foreign sources of energy, as well as the pollution associated with that energy. Become self-sufficient with solar! When it comes to solar system installations here in Sutter County, you want to maximize the benefits you can enjoy when you decide to go green. While some Northern California solar companies take the one-size-fits-all approach, we work hand-in-hand with our clients to design and install the best renewable energy system for their property. We do this by tailoring the energy system to your specific needs and energy goals to optimize your savings while making the best use of your space and keeping costs down. Does your home or business have limited space or areas with a lot of shade? No problem! We engineer and install systems that work within your budget, yet give you the power to harness optimal energy from the sun to power your property and keep costs down. If you’re convinced that solar is the way to go, we look forward to working with you! Reach out to our team today to get started.